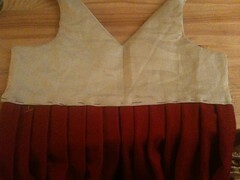 the wills of the tudor ties show that rd was a good colour for a petticoat! the term kirtle and petticoat are variously synonymous and confusing to non historical textile specialists! However, a bodied petticoat can be of all wool [and look like 'a kirtle' to non professional eyes] or be woolen skirt with a linen top [ - a bodied petticoat] . This needs to be worn with a waistcoat, but doesn’t have to have a kirtle over it for us poorer types in the summer. So I thought i would make for DD3. This is side lacing. I found a kirtle that fitted her well for the body belonging to someone else though far too short, and took a basic pattern from that and then fiddled with it a bit so it fitted DD3 well. The front is straight and the back with a v. I had planned to use denim in the middle, as nice and stiff, but failing finding an old skirt/jeans, had this upholstery fabric. Of course several layers of canvas would have been more appropriate. It is to give the upper portion some rigidity. 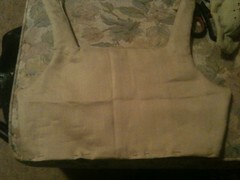 there are 2 layers of linen in front [to hide it completely] and one behind. 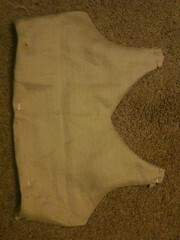 I actually cut my linterlining a cm short so the wool join will be a cm inside. Not sure whether this is a good idea, but thought might lead to a less bulky waistline. Also have some spare linen here so can extend waist further down if needed. 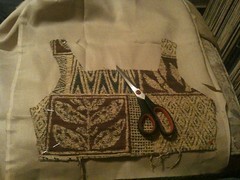 I basted the interlining onto the hidden inner linen layer all the way round and down the centre so that it wouldn’t move around, just like in other bodices, and the hand sewed back stitch all the way around apart from the bottom and turned to the right side outermost. All 3 linen layers are behind the interlining when doing the stitching, and just pull one forwards when turning inside out. I fitted against DD3 again, and realised the shoulder straps ideally needed a bit more length, so unpicked them and added a cm of length. 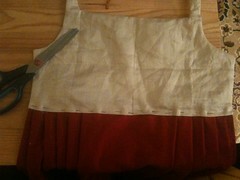 For the skirts, I knife pleated a 60′ width for front and back so DD3 can twirl and dance. I measured and remeasured against the body, and when had pleated so I liked it, I did a running stitch along the top of the pleats to hold them. 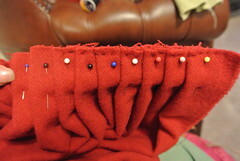 this is also useful if i decide to change the bodies in the future, as the pleated skirt doesn’t all come undone. 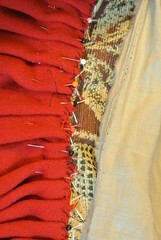 I whipstitched [sort of] onto the bottom end of my sturdy interlining. [you can see the whipstitcjinh in black and the basting of the interlining in white] . 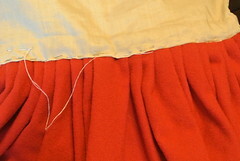 i pinned the linen on where it needed to go over the top [ about a cm below my interlining for the outside and half a cm for the inside] i sewed the inside linen to the skirt first in very strong backstitch double thread to hold securely, and then the outside is just hemmed on. 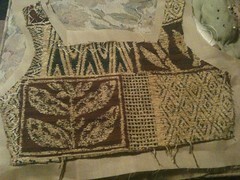 I need the whipstitch to the interlining, and the backstitch to the inside linen to take the weight and provide the strength. 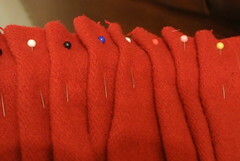 The skirts were then seamed, I would have done a run and fell, but this is a selvedge edge, so a simple seam, and then hemmed to the right length – an inch or 2 above the ankle. DH did the eyelets. 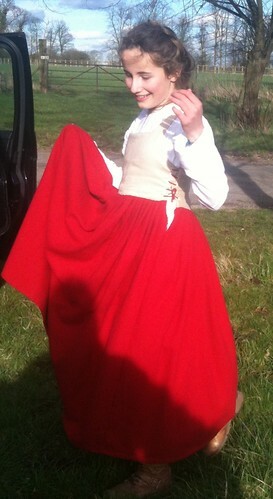 Whilst at the open day at Kentwell, I chatted to Julia, [an elf!] and discussed BB being too hot on the hot days in her thick wool kirtle, and I had some thinner wool matching the colour of FrB, and could I make her a petticoate bodies like this, but on the thinnest of thin sides, to be used on hot days without kirtle [tho clearly should normally be worn with sleeves if not working] we decided we could as have a little jacket that she could have available to ‘put on’ if gentry passing by. So, a second, lighter petticoate bodies was made, as above, but with no stiffening layer in the middles and very very light wool! This entry was posted in clothing, Kentwell 1578. Bookmark the permalink.